On July 2 at Christchurch, Dorset, Mr. Kenneth B. Croft was elected Master of the Winchester and Portsmouth D.G., taking over from Mr. Roger R. Savory, who did not wish to continue in office. Roger was nine years Master, and before that served for six years as general secretary. 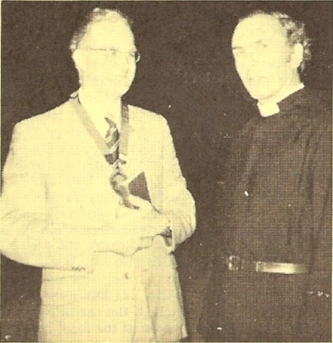 Our photo is of Mr. Croft with the Vicar of Christchurch Priory (Rev. B. H. Trevor-Morgan), who previously was the incumbent at Stourbridge, Worcs. The W. and P. A.G.M. was held this year on July 2nd in the Priory Hall, Christchurch, Dorset. The meeting itself was, perhaps, one of the shortest to be held in recent years being only about 2½ hours in length, but during that time the winds of change blew strongly. The Master (Roger Savory) announced that he was not going to stand again as Master. He spoke frankly and stated that he had served as Master for nine years, being re-elected twice, and before that had served as secretary for six years. Fifteen years was enough, he said, and he spoke of his feeling jaded by the heavy responsibility and that it was time for a new man. However, as he spoke it was obvious that this was a poignant moment for him, and he gave a brief glance back over his time as Master and felt that the Guild had grown enthusiastically to a condition of maturity. From the chair he proposed Mr. K. S. B. Croft and the meeting acceded to this proposition and so elected the new Master. Almost as soon as Mr. Croft had been invested with the badge of office, it fell off! and self-appointed Guild augurs mumbled their prognostications amidst the general laughter. Three new senior officers were also elected: Mr. J. P. Colliss (treasurer), Mrs. G. Nabb (librarian) and Mr. R. LeMarechal (peal recorder). From the meeting it became obvious that for the next triennial period the Guild officers have much to do. The Guild Centenary is celebrated in 1979 and the Central Council is expected to hold their meeting in W. and P. territory in the following year. It was felt in view of the fact that a formal Centenary Dinner would probably be organized in 1979, and the somewhat diminished numbers at this year's dinner, that 1978 should be a year for experimentation in this area, and it was decided not to hold a dinner on the usual lines next year. The idea was floated that the seven Districts in turn should organize a social occasion each year, with a free hand as to the form it should take. After a member of the Portsmouth District had voiced an opinion on the subject, and Isle of Wight members had informed the meeting that Portsmouth was the one place in the Guild which they could reach easily, the Portsmouth District found themselves with a sub-committee entrusted with the responsibility for 1978's social event. The report of the Trustees of the Bell Restoration Fund again stimulated comment, and the usual split in the meeting appeared. Some members, obviously speaking from a church angle, realised that the Fund is only part of the money that the Church finds at its disposal (and that only for the ornamental fabric) and although the Fund should be wholeheartedly encouraged its limitations must be seen; others were keen for the Fund to be built up at all cost, be run by financial expertise and administered lavishly. The Treasurer, speaking of the Guild's financial position, mentioned not only a possible levelling-off of the B.R. Fund now that it had reached £3,500, accumulated in the first flash of enthusiasm, but also pointed out the sharp decrease in money available in the Central Fund since there had been a large outlay on new badges. With the economic situation far from rosy, the new treasurer, when he takes over the books, hardly inherits a cornucopia. Some of the officers who were appointed at the meeting: (l. to r.) Roy Le Marechal (peal recorder), John Colliss (treasurer), R. Mark Esbester (BRF trustee), Fred. Collins (BRF trustee), Barry J. Fry (gen. sec. ), Graham Nabb (report editor), Phillipa Nabb (librarian), Ken Croft (Master), Roger Savory (Central Council). Within the context of the meeting, the above matters were by far the weightiest. They gained much since they involved the interest of the meeting as a whole, or at least seemed to do. This was in contrast to the various officers' reports, which, although time-saving by virtue of their being printed in the annual report, excited little interest, possibly by not being delivered by word of mouth. The Guild was well entertained at Christchurch, the organisation being supervised by Mr. A. V. Davis, which included the service in the Priory, the day's ringing and the tea. It was noticeable that there were distinctly more people at the tea than at the meeting, possibly symptomatic of a not unambivalent attitude towards the business meeting itself. That evening the Priory bells rang out until 9 o'clock, inaugurating the forthcoming triennial period under new leadership. Guild Officers.- Master: Mr. K. S. B. Croft. Hon. Sec. : Mr. B. J. Fry. Hon. Treas. : Mr. J. P. Colliss. Hon. Peal Rec. : Mr. R. Le Marechal. Hon. Lib. : Mrs. G. Nabb. C.C. Reps.: Messrs. R. R. Savory, K. S. B. Croft, J. Hartless, R. Cater.